Telecentric lenses are specially designed lenses for measurement applications. Due to the telecentric perspective no measurement error occurs caused by an incident angle. Contrary to standard lenses with entocentric perspective, beam path in front of the entrance lens is parallel to the optical axis at telecentric perspective. Therefore, the magnification stays constant for the complete depth of field. Consequently measurement errors can be minimized or eliminated for an object with certain depth or for a slightly tilted measurement surface, even for a various working distances. Telecentric condition requires a characteristic (construction) shape: Clear Aperture (C.A.) of the front lens element has to be larger than the target size. Length of the lens is considerable larger compared to entocentric lenses due to the focal length of the front lens. The working distance is fixed. Only in special cases, it can be customized by modifying mechanical or optical components. Most of our lenses have a variable aperture stop. Therefore the amount of light, resolution and depth of field can be optimized as required for the application. Equivalent to entocentric lenses, a large aperture size improves amount of light and resolution. A small aperture size improves depth of field. Telecentricity and distortion are not affected by a variable aperture stop. Variable components can affect the usability in industrial applications with vibrations or moved mechanics. Therefore a fixed aperture stop provides advantages. Some lenses have a fixed aperture stop in standard version. Additionally we are able to supply every lens with fixed stop as customized modification. For paraxial consideration the correlation between NA and F# can be calculated. Therefore the object-sided NA and image-sided F# have to be considered. 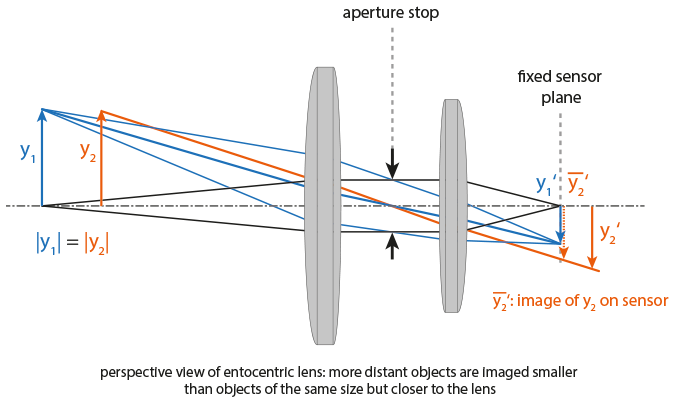 Depth of Field is not larger at telecentric lenses compared to entocentric lenses. Due to the telecentric perspective, however, the complete depth of field can be used for correct measurements at a constant magnification. This is a significant advantage for various measurement applications. Depth of field is based on magnification, aperture stop size and required resolution. Best aperture stop size and resolution depend on the application. Therefore no values for depth of field are stated in our catalogue. A smaller magnification enlarges the depth of field in two respects: First regarding the value of magnification in the formula. Furthermore a demagnifying lens needs a considerably smaller NA for a defined resolution. Additionally optical design, waveband and object size affect the depth of field. Please contact us for any requirement, we are prepared to calculate the depth of field for a certain lens based on your configuration (object size, resolution, illumination wavelength, best stop size). The range of telecentricity describes the maximum axial shift of an object point to avoid any measurement error due to a residual error in telecentricity. Maximum telecentricity error and imaging performance are published in our data sheets. Performance of imaging lens is always represented by modulation transfer function (MTF). It demonstrates the relationship of contrast depending on the spatial frequency. Performance is limited by the diffraction due to the aperture stop size. A large NA results in a better resolution, but requires also higher demands on the design. Furthermore imaging performance depends on object size and magnification. Smaller object size and smaller magnification value result always a higher MTF. A MTF-plot for different field sizes is available on datasheets at our website. Field height is stated as half object diagonal length. The tangential (T) and sagittal (S) performance for each field height is listed as well. A bi-telecentric lens design has a parallel chief ray path at both, object and sensor side. This provides an advantage at very large line and matrix sensors or at sensors which require a defined incident angle of chief ray (e.g. micro lens array sensors). In most cases, object sided telecentric lenses provide the same performance like bi-telecentric lenses. Contrary to entocentric lenses, where magnification can be modified by adjusting working distance and focus, the magnification remains constant at telecentric perspective. Magnification results out of division of image size by object size. The according sensor size and fixed magnification result in the object size. Due to the telecentric measurement principle, the diameter of the front lens has to be larger than the diagonal of the field of view. To ensure that the suitable lens for the required field of view can be found comfortably, our lens series Correctal TCL and Correctal T are arranged by the clear aperture. For each lens, the maximum sensor size is mentioned without considerable vignetting. For circular objects or targets with non-standard formats, even larger sensors can be used. Please contact us for any assistance you may need. Typical line lengths for line and matrix sensors are 28.6 mm 35.0 mm, 43.3 mm and 60.0 mm. The maximum sensor size is also influenced by the mounting thread of the camera. Exchanging the thread of a standard optical design my result in an appropriate lens. Distortion is the deviation of magnification depending on the field size. Telecentric lenses have no defined smaller distortion than other lenses, but they were designed with a minimum distortion error to meet the demands of high precision measurement applications. The maximum distortion error for each lens is specified in our catalog. For smaller field sizes (object and image sizes), smaller values will occur. 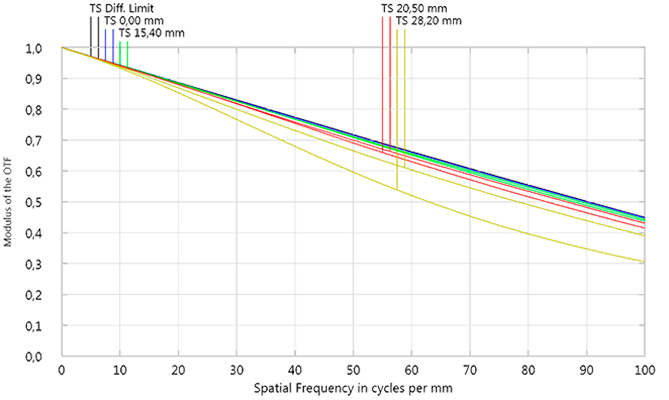 A distortion plot is stated on data sheets at our website. Variation of aperture size with variable stop does not influence the distortion. Most of our lenses are designed for visible wavelength range between 450 – 700 nm. They are suitable for monochromatic applications (narrowband illumination, black/white sensor) and polychromatic applications (wideband or white illumination, color sensor). Some special designs, however, are specified for a certain wavelength or narrow waveband. Upon request we are prepared to check the compatibility of our lenses regarding your specifications. Please refer to the product lists on this homepage regarding data sheets, outline drawings and STEP files. Back flange distance is defined as distance between location surface of lens at camera and sensor plane. We offer several adapters in à accessories to adapt back flange distance and thread yourself. Usually the locking rings are not glued. No additional costs will be charged, however, if a glued version due to moving parts or vibration in industrial setup, is required. Please use the extension /VKL on your inquiry or order. A variable stop inside the lens always has variable mechanics, which may cause problems. To improve industrial capability, all lenses with variable stop can be modified to lenses with fixed stop. Please mention this modification also on your inquiry or order. The optimum stop size can be calculated or a lens with variable stop can be loaned for evaluation. Our lenses with standard fixed stop are marked with a blue dot in our catalog.